As JPMorgan Chase (JPM), one of the strongest U.S. banks, gets the big financial company earnings going on Wednesday morning, investors will be looking for signs of how the slow economic recovery is affecting its businesses. Among the questions they have are: How are JPMorgan's loans performing, how is its loan volume doing, what are its loan delinquency rates and how is its investment banking business doing? Analysts polled by Thomson Reuters expect the bank to report earnings of 64 cents per share, up from 40 cents last year. JPMorgan's investment banking business, which had a great year in 2009, could be returning to more normal levels this year. In 2009 around this time, fueled by government backing, many financial institutions and corporations raised cash in the capital markets. Much of the capital raises were done with the help and advice of stable institutions like JPMorgan, which pocketed big fees. However, this year, corporations are turning to other investment banks to help meet their financial needs. In the first quarter of this year, for instance, JPMorgan's underwriting of debt and equity issues in the U.S. capital markets fell 2.6% to $132.6 billion from the same period last year, according to data tracked by Thomson Reuters. However, its consumer-related businesses might start to see some improvement. But its credit card portfolio, which lost $2.2 billion in 2009, might be tough to turn around given recent regulatory changes. "In 2009, in addition to the terrible environment, the U.S. credit card business faced fairly dramatic changes because of a new law enacted by Congress in May. The new law restricts issuers' ability to change rates and prohibits certain practices that were not considered consumer-friendly," said CEO Jamie Dimon in his annual letter to shareholders. "These changes alone are expected to reduce our after-tax income by approximately $500 million to $750 million." Its home lending business will continue to post losses for at least three years, warned Dimon. However, analysts expect the bank to lower its loan loss reserves. "We expect to see continued improvement in its loan-loss provision, which should boost earnings," says Jason Goldberg, an analyst at Barclays Capital. Goldberg also notes that shareholders will be keen to hear a timeline on when JP Morgan will return to paying higher dividends of 75 cents to $1 per share, compared to its current 20 cents a share. "We continue to believe this is still several quarters away, as it wants to wait until it has a clearer picture of the economy," Goldberg says. 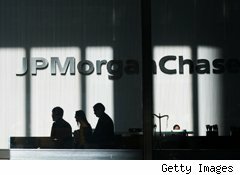 JPMorgan could have some other postive surprises. For instance, small-business loans, which were down 58% last year, could have a turnaround in 2010. Dimon noted in his letter that he's already "seeing increased demand from more qualified customers." Another area of growth for the bank is auto lending. In 2009, JPMorgan became the largest U.S. auto lender, financing more than 1.1 million auto loans, up 25% from 2008. As consumers slowly start buying cars again, the auto lending business could turn out to be a winner.